Welcome to our Put-in-Bay Fishing Charters! 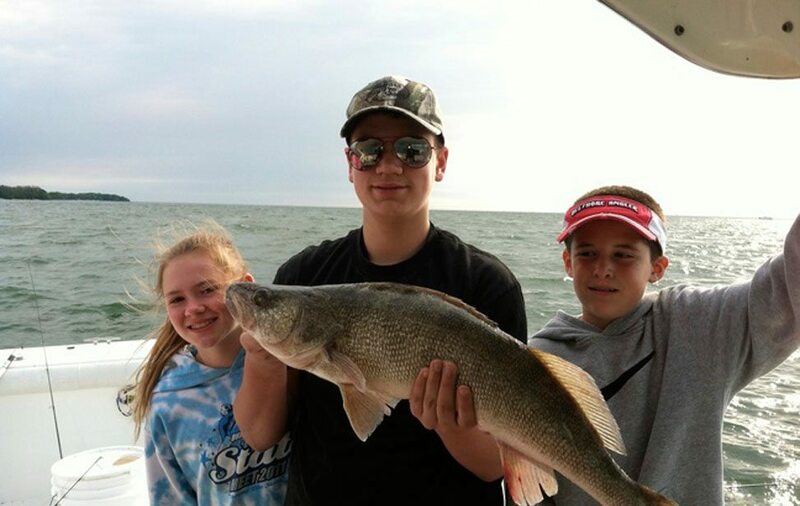 Charters are some of the most often requested services on the island from visitors wanting a hands-on experience grappling with a feisty Lake Erie Walleye or delicious Yellow Perch. The sport fishing in Lake Erie is some of the best you will find anywhere in the midwest. It is not unusual to see anglers and their rigs from North Dakota, Minnesota and other faraway destinations in search of a daily limit catch. Remember that to fish in the Lake Erie waters by charter or personal boat you will need an Ohio Fishing License. Lake Erie as beautiful as it is can go from flat calm to dangerously rough very quickly so it is always a good idea keep a close eye on the weather and practice safe boating. Many charters depart from the downtown Put-in-Bay area to the west of the Boardwalk Restaurant and are available by 1/2 day or full day. Experienced Captains will put you on the fish, clean your catch and recommend local restaurants that will prepare your fish. Boats are operated by US Coast Guard licensed Captains and include the latest modern electronics, fishing gear, and safety equipment. During the peak fishing season, many Captains are booked far in advance so it is recommended that you book early. In the event you are not able to find a local boat there are numerous boats available in the Port Clinton are walking distance from the Jet Express Ferry that can accommodate your requests. Captain Bruce is an island favorite. Captain Joe runs a tight ship! Based in Port Clinton, but serving PIB! We provide all bait, rods, and reels.